Tay works in an impressive, naturally lit, 150sqm studio, ideally situated on the edge of a lake, bird sanctuary, and endless mountain views. It is here that she is inspired by an emotional confidence and technical maturity marking her bold, innovative and recognizable style. Abstract artist Tay Dall, is known for emotionally charged oil paintings on unusual surfaces like old doors and shutters. "Culture presents us with icons of idealized states of being," she says. "These are, however, extremely transitory. I therefore physically alter the surface of everything I paint, allowing my voice to come through. "My works express many feelings through line and colour. I hope the resulting visual atmosphere will touch viewers emotionally." Tay, a 1.8 meter live-wire, returned to South Africa in 1995, after living in Los Angeles, California for eleven years, where she studied, worked and exhibited her work in numerous galleries. She is married to business partner, Ben Chowney and has two children Zoë and Tal. 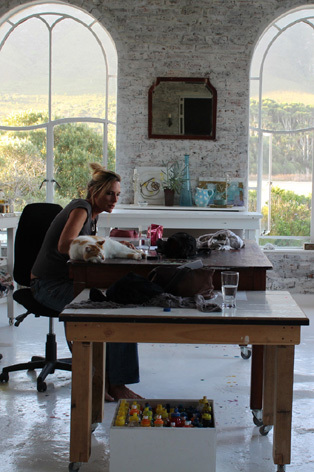 Her home and studio are located along a nature reserve near the beautiful seaside village of Hermanus, Western Cape. Tay has unstoppable energy and has participated in dozens of successful group and solo shows. An emotional confidence and technical maturity marks her bold and innovative style. Her art is represented in 34 galleries, over three continents and has been placed in numerous private and corporate collections in the United States, Europe and Southern Africa. Tay is an avid collector of old and interesting painting surfaces including old doors, windows, shutters, pieces of wood and any other unusual material she can find. Some of her works still contain original handles and sections of stained glass. "Every surface is unique and this affects the final artwork," she says. "I tend to disregard conventional surfaces. Castaway items hold a realm of possibilities beneath my brush and elicit an ironic truth about my sense of natural beauty." While studying art at Michaelis School of Art, UCT, Tay drew anatomical illustrations for her orthopedic surgeon father Dr. Des Dall. After closely studying hip replacement operations, she would produce finely detailed pencil works showing minute bones and muscles. These illustrated his articles in the prestigious British Journal of Bone and Joint Surgery. She then enrolled for Critical Studies in Film at the University of Southern California, followed by an Interactive Multimedia course at the American Film Institute. She soon rose to the ranks of assistant director, but found film "too collaborative a medium" and began managing an art gallery and producing more of her own work. Eleven years in the cultural melting pot of Los Angeles gave Tay more confidence and inspiration, leading to work that was increasingly individual and experimental. "The over-riding expression in my paintings is not about the personal, but about essence," she says. "The essence of abstract form and symbol and my ongoing attempt to find an essential reality." A longing for South Africa made Tay eventually return. "It took time to realize I was feeling homesick. If you don't come back every few years you lose a sense of yourself - your own culture is unique. South Africa is a beautiful country and there is a rhythm in Africa you can' t feel anywhere else. "I feel much more focused and centered surrounded by nature - one is not so side-tracked. The lighting is also different and there is more atmosphere around me. "I paint for the purest pleasure of creation, for the free flow of subconscious thought, for the need to escape the confines of law and order. Mostly, my art expresses my way of seeing things."